I’ve been caught up in the labyrinth of teaching for the last couple of months, while the deadline for The Unwritten looms frantically closer, so finding the time for writing anything ‘creative’ has eluded me. Happily, I found the little seed of inspiration I needed in a recent study about growing ‘green walls’ on city streets. Green walls are one of the best applications of the 20th century sustainability cult. Of course, like most trending ‘green’ things, green walls have been around for ages – Nature invented climbing plants, after all, but the first man-made creations could have been in the legendary hanging gardens of Babylon. ‘Green walls’ have grown happily for centuries, in various forms, without the aid of a gratuitous label, or the endorsement of a strategic advisory panel. Any English manor house worth its salt (or any of its Continental counterparts, for that matter) had at least one wall crawling with ivy, or another equally thigmotropic plant, on its property. French botanist Patrick Blanc is credited with creating the first mur végétal in Paris in the late 1980s, and he has since sown edifices all around the world (check out his website for some awesome pictures). However, the first registered patent for a ‘vertical garden’ or green wall structure was in 1938 in Illinois by Professor Stanley Hart White, the brother of author E.B. White. These days, green walls and roofs are popping up all over the place, especially in urban metropolises where building landlords are keen to embrace anything that will boost their sustainability rating. Green walls of tiny succulents even appeared recently at the renovated rooftop beer garden in my local pub…I’m not sure how the little plants cope with all the cigarette smoke, but the walls look great anyway. As I mentioned above, the study in Environmental Science & Technology investigated how green walls and roofs affect air pollution at street level, in and around urban ‘street canyons’ (streets that are lined with tall buildings, inhibiting air flow). The authors found that while rooftop gardens had little impact on street level pollution (makes sense), green wall vegetation within the street canyons reduced street-level concentrations of nitrogen dioxide (NO2) by as much as 40% and particulate matter by 60%. What about trees? Well, the authors stress that trees still help to clean the air – but only in certain contexts, and at much lower levels. It seems that when pollution levels are very high, too many trees can actually increase NO2 levels near the street by trapping the pollution where it forms, instead of allowing it to disperse and mix with upper layers of air. I can think of a few other benefits of greening street canyons. Previous research (and plenty of commonsense) tells us that ‘green’ (as in Nature, not the trend) views have a positive effect on mood and mental balance of humans in general, and especially on those of us trapped in urban caves. Also, don’t forget all the little insects and birds that will find new homes in these vertical forests. Maybe a little bit of biodiversity will help balance the pesty plagues of rats, bed bugs and cockroaches that cities are often associated with. The fairytale character inside me just quivers with delight at the thought of high-rise city façades whispering with verdant leaves and tendrils, reclaiming inch by inch the cold cement and glaring glass with layers of hidden Life. 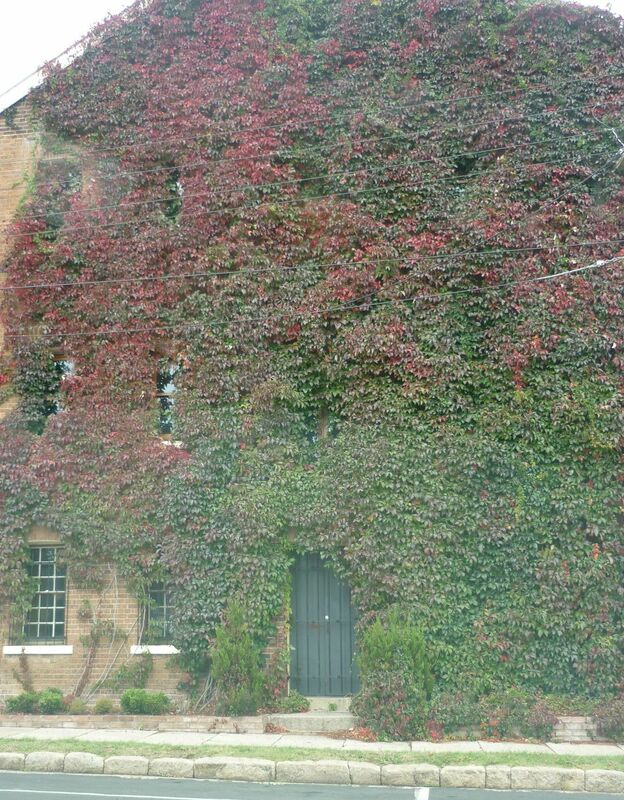 An original ‘green wall’, Glen Innes, New South Wales.